So here it is my city such as I am living it and also invites you to discover it. Our Villa “the Corniche” is this hyphen between these two villages. This family house of the beginning of last century, decorated with frescos on the ceilings, offers a single panorama on bay the bay of Golfe Juan and the islands of Lérins. Dominating the city, the Villa “the Corniche” is welcoming you….Let you be charmed by the place…. Nobody can ignore that Golfe Juan was the city which welcomed Napoleon in 1815 from his exile return of the island of Elba. Not so far away from the Lérins islands, Golfe Juan offers sand beaches and two marinas. It will suit to the people that loves the sea. And, it is from the sea that you will be amazed to see that the town of Golfe Juan Vallauris is preserved from the real estate pressure. You will be surprised to discover green forest on these abrupt hills where the farmers could cultivate flowers and citrus fruits with the price of enormous building work for creating “restanques” (terraces in Provence). You will discover in the hills streets Villas that Russians and English of the 19th century built to enjoy the exceptional way of life. Golfe Juan is also anchored in the present time with its Theatre of the Sea where musicians and artists performs their art. Golfe Juan has also its fresh fish market in the old harbour. Nobody speaks about Vallauris without evoking the pottery, whose origins go back to the beginning of our era thanks to its area rich in argillaceous ground and to the woodforests of Alep pines. In the 16th century, the implementation of families coming from the surroundings of Genova (among which many potters) made pottery naturally the first artisanal and commercial activity of the inhabitants. Art Ceramic will appear at the end of 19th century in particular introduced by the Massier family. 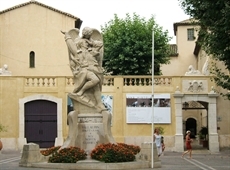 Vallauris will later welcome number of famous artists as Picasso and Jean Marais. In Vallauris, you will visit the Castle-Museum where many exhibitions take place. You will do your market shopping in the old market close to the church in front of the statue of “the man with the sheep” of Picasso. You will visit the old city with characteristic streets chess organization and then you will go especially to Nérolium to buy orange tree flowers fragrances. Along the Clémenceau avenue you discover all the pottery shops which made Vallauris famous.